If AutoHotKey is running in the Parallels Desktop and "#;" is a shortcut Autohotkey recognizes, it will act just as if the shortcut were invoked from within Windows itself. The applescript snippet can be run from TextExpander, an application that reproduces some of AutoHotKeys functionality (AppleScript supplies most of the rest). This setup opens up all kinds of possibilities for interaction between the two operating systems. So far, I have just set up this TextExpander/AppleScript Combo to start ConnectedText, Quicken and SyncBack, Once they are running I can control them with AutoHotkey in Windows. ConnectedText, AutoHotKey, SyncBack, Windows Live Mesh and Quicken are the only windows applications I am still using. I hope to replace Quicken for my budgeting and keeping track of financial matters with a native Mac OX application. The other four I will keep. AutoHotKey for automating ConnectedText, SyncBack mainly for backing up my ConnectedText files to a folder that synchronizes all my computers (by means of Windows Live Mesh). P.S. : I solved the problem with AHK always opening up in notepad whenever I left and returned to the Parallel Desktop. The culprit was a snippet that allowed me to edit the file in use easily. P.P.S. : I saw on the Internet another solution to opening windows programs from the Mac with an AppleScript and short cut keys for windows applications, but it did not work for me. 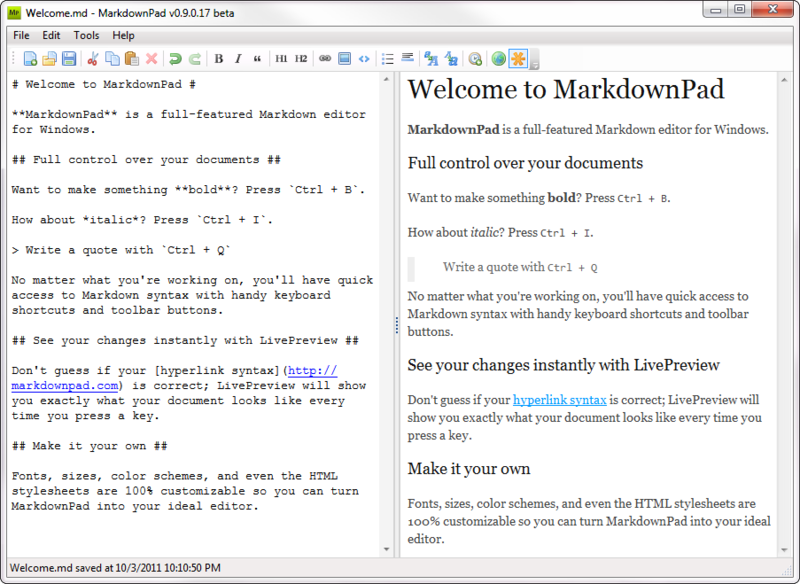 Markdownpad is a markdown editor for Windows. 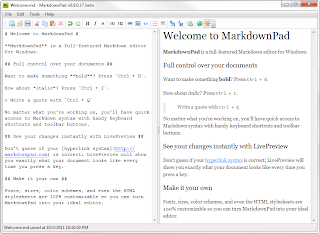 Markdown is a text-to-HTML conversion tool. It allows you to write using an easy-to-read, easy-to-write plain text format, then convert it to structurally valid XHTML (or HTML). In other words, its just like Txt2Tags or many of the Wiki dialects. It's an interesting idea, reminding me of Multimarkdown composer and Marked on the Mac, but it is free. Marked is just $3.99 and provides live preview of Markdown or MultiMarkdown in any text editor (including in MultiMarkdown Composer). NvAlt provides MultiMarkdown preview for free. Markdown does not do footnotes. MultiMarkdown does—sort of. And Scrivener does MultiMarkdown well. 1. There are many other Markdown editors, like Gonzo, Markdown-Editor, Mou and Wysiwyg Markdown Editor. TextMate can convert Markdown to HTML as well. 2. MultiMarkdown Composer exports directly to HTML, LaTeX, Flat Open Document (.fodt), OPML and RTF. 3. See also ByWord which has a preview mode. I tried to run ConnectedText with Wineskin Winery. It worked, but I found it rather unsatisfactory. The application looked rather ugly because it substituted strange fonts for menus, toolbars, etc. I also could not make it to recognize different styles. Even though it worked and even though I think the font issue could perhaps be solved (with a lot of tinkering), I deleted it again. Wineskin Winery cannot deny its heritage, it seems to me: Linux (or Unix). I find Parallels superior. Python also works in it the way it is supposed to. I am so used to Autohotkey that it would be difficult to do without it. I tried Text Expander which is also very capable, but it is very expensive. I would really like to know why Parallels insists on opening the script in Notepad every time you switch between its Desktop and the OS X Desktop. It turns out that compiling my script solved the problem. This makes changing it a little harder, but it is a lot easier than the alternative. After having problems on my office computer with Windows and wasting another six hour of my life with a PCR error that would not let me print, a printer driver that I could not uninstall because there was a document in the print queue, etc., etc., I have decided to give the Mac another try. I could make the problem disappear, but what bothers me is that I have no idea what I did to make it go away. I now bought a Mac Mini and Parallels. Installed Windows 64 (32 bit) on the Mac, and spent most of the weekend making it work. It took a while, but I now have the most important programs running on the Mac and on the virtual Windows in Parallels. Printing of Windows applications is handled by OS X, by the way. It's not without problems. Autohotkey does not play nice with Parallels or Parallels does not play nice with Autohotkey. Don't know what causes it, but the script file starts in Notepad whenever I switch from OS X to a windows application. One good thing--actually the only thing I really require of Windows at this point--is that Parallels runs ConnectedText without a hitch. But what really blows me away is that "Parallels Mobile," a companion application, can connect to a running copy of ConnectedText (or any other Windows application) on the desktop so that you can actually work in ConnectedText on the iPad. The virtual keyboard obscures much of the screen (when it's open), but it works, and the topics are immediately updated as they are written. This is great! Softwaretopic.informer.com is obnoxious. It arbitrarily combines words so it insinuate itself into Google searches. Search for "personal wiki" and you get a page for "myob plus wiki" from this "service," for instance. Should you click on the page you get all kinds of things for "wiki" and a program called "MYOB Accounting Plus." Every day there are more inane and annoying combinations like that. I try not to fall for this ploy, but I do at least once a day. I blocked the site in Google's search settings, but it seems to make little difference. It's nothing but "Search Spam" and it should be penalized by Google, not receive a high score in searches. Don't know whether I ever mentioned this: ConnectedText includes automatic version control for every topic. I find it very useful. Atlantis also includes version control of sorts. It allows you to back up a file automatically at certain intervals. It's better than the Microsoft way. Sometimes this is not enough. I then use Backup Revision File. It's an AhK application that allows you to specify files it monitors and then prompts "the user for a 'file save' and then asks you for some text input (which you can ignore). These solutions are more than enough for me. Don't need Git or any of the other fancy server-based solutions. 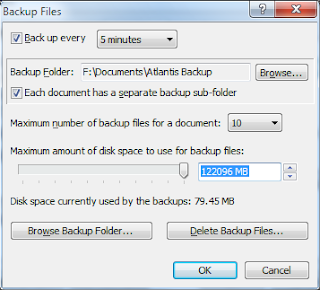 I tried Autover for a while, but ultimately I liked Backup Revison File better.